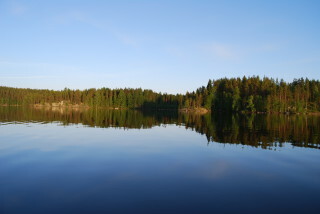 Hirvensalmi provides marvelous opportunities for hiking, paddling, rowing, boating etc. There are three nature trails for hiking in Hirvensalmi. Maps of these trails can be bought from town hall. On both lakes there are many marked places where you can go ashore and camp. On those natural harbors there are always dry wood and fireproof place for your campfire and also toilet facilities. Harbors are mainly situated in quiet islands and most likely you can enjoy the nature by yourself. In midsummer there is bit more crowd on the lake. You don`t have to stick on the official routes but you can make your own. You can hike pretty much anywhere because of the public right of access.